According to a new market research report published by Credence Research, “Waste Management Market (by Waste Type (Industrial Waste, Municipal Waste, E-waste, Bio-medical Waste, Other Waste Types), by Service Type (Collection & Segregation, Disposal), by Geography (North America, Europe, Asia Pacific, and Rest of the World)) – Growth, Future Prospects, and Competitive Landscape, 2018 -2026”, the global waste management market is expected to expand at a CAGR of 7.5% during the forecast from 2018 to 2026. Waste generation rates are on a rise. This must be credited collectively to the improving standard of living, industrialization, urbanization, and also evolving digital habits of consumers. According to the statistics released by the World Bank, the world’s cities collectively generated 2.01 Bn tonnes of solid waste, which was equivalent to a footprint of 0.74 kilograms/person per day in 2016. With economic development, population growth and consequent urbanization, annual waste generation is expected to surge by over 70% from 2016, reaching 3.40 Bn tonnes in 2050. As compared to developed economies, people in developing countries, particularly urban poor, are severely affected by the untenably managed waste that is either openly incinerated or disposed in unregulated dumps. Such practices have led to serious health and environmental consequences by serving a ground for disease vectors and changing global climate through methane generation. Thus, overriding need to manage, control, and recycle waste that ascend due to scrap landfill and incineration is one of the major factors driving market growth. In addition, government regulations with respect to waste collection and recycling along with initiatives like ‘Smart City’ by the governments will heightened the need for efficient waste management worldwide. On the flip side, high costs associated with waste management, particularly for buying high-end recycle machineries along with inadequate infrastructure for waste collection, transport, process, and disposal in developing economies are hindering the market growth. Effective and efficient waste management is expensive, often comprising 25% – 55% of municipal budgets and requiring integrated systems that are sustainable, efficient, and socially supported. However, growing awareness regarding its environmental impact and consequent health effects, demand for waste management services is expected to increase in the coming years. 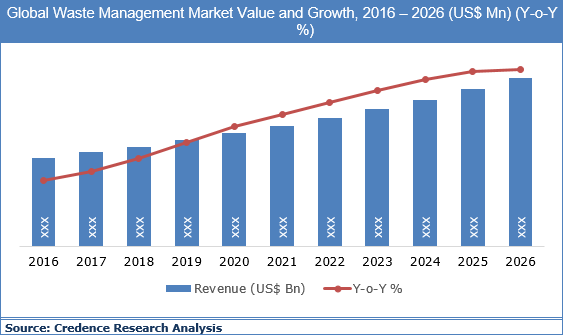 The global waste management market is fragmented and characterized by the presence of firms involved in scrap collection, treatment, processing as well as recycling. Some of the major service providers profiled in the research study include Advanced Disposal Services, Waste Harvesters, Inc., Covanta Holding Corporation, Biffa Group, Clean Harbors, Inc., Remondis AG & Co. Kg, Hitachi Zosen Corporation, Suez Environment S.A., Daiseki Co. Ltd., Veolia Environment S.A., and Waste Management, Inc. among others. the global waste management market is expected to expand at a CAGR of 7.5% during the forecast from 2018 to 2026.